We are happy to announce the NEW DATE and VENUE for our event with Carrie Brownstein! 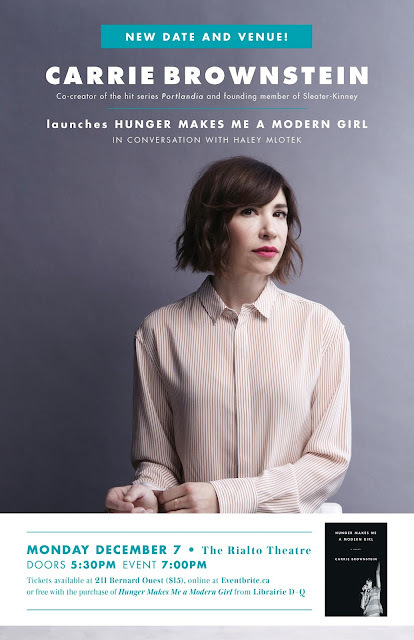 Brownstein will launch her book Hunger Makes Me a Modern Girl, in conversation with Haley Mlotek, TONIGHT Monday, December 7 at the Rialto Theatre (5723 ave. du Parc). Doors at 5:30 p.m., event at 7:00 p.m.
More tickets now available in-store at 211 Bernard Ouest, as well! Please note that there will be no public signing .We will have pre-signed books available for purchase and signed bookplates for any copies of Hunger Makes Me a Modern Girl previously purchased at the Librairie. Carrie Brownstein is the guitarist in pioneering rock band Sleater-Kinney and the creator/co-star of the wildly popular television show Portlandia. Hunger Makes Me A Modern Girl (Riverhead Books) is Brownstein's debut. It's a candid, funny, and deeply personal look at making a life—and finding yourself—in music. Browstein writes about escaping her turbulent family life by plunging into the indie music scene, where she was able to find the means for self-invention. She captures the experience of coming into her own as a driven female performer in the 90s, and finding community in the then-burgeoning world of underground feminist punk-rock. We regret that Jessica Hopper (The First Collection of Criticism by a Living Female Rock Critic), who was to be the host of the original event, is unable to make it on this new date. However, we are excited to tell you that Haley Mlotek will be joining Brownstein for an on-stage conversation! Haley Mlotek is a writer and editor based in New York. Her work has appeared in The New York Times Magazine, The National Post, The Globe & Mail, The Guardian, Little Brother, Hazlitt, The Walrus, The L.A. Review of Books, The New Inquiry, n+1, and The Awl, amongst others. Previously, she was the editor of The Hairpin and the publisher of WORN Fashion Journal.